A community of faith, hope, and love, the Fellowship of Mosaics exists to build authentic koinonia while pursuing the Great Commandment (Matt. 22:36-40) and the Great Commission of Jesus Christ (Matt. 28:16-20 & 2 Cor. 10:15) especially for the Mosaic Generation (“Gen Y” or “Millennials” and “Gen X”) in the Sacramento Metropolitan Area. 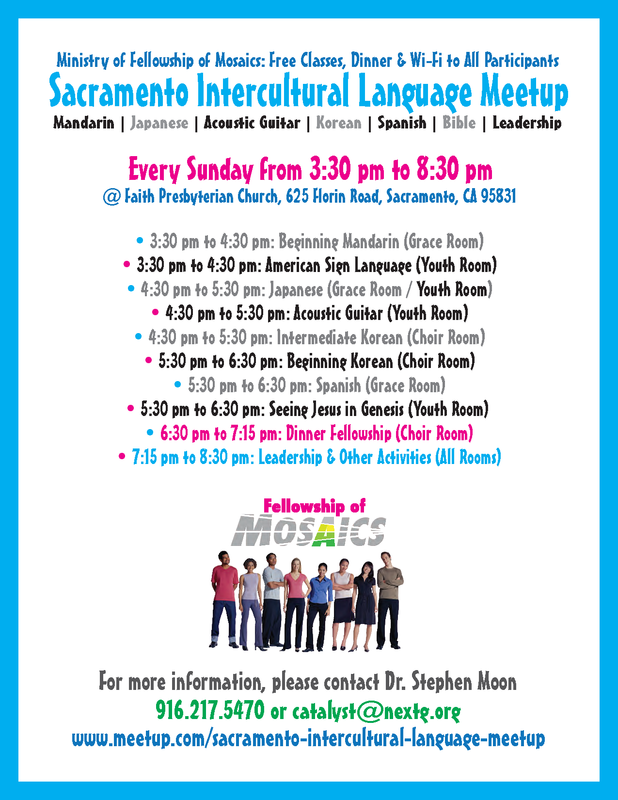 Sacramento Intercultural Language Meetup is every Sunday from 3 pm to 8:30 pm. at Faith church. More information see below.